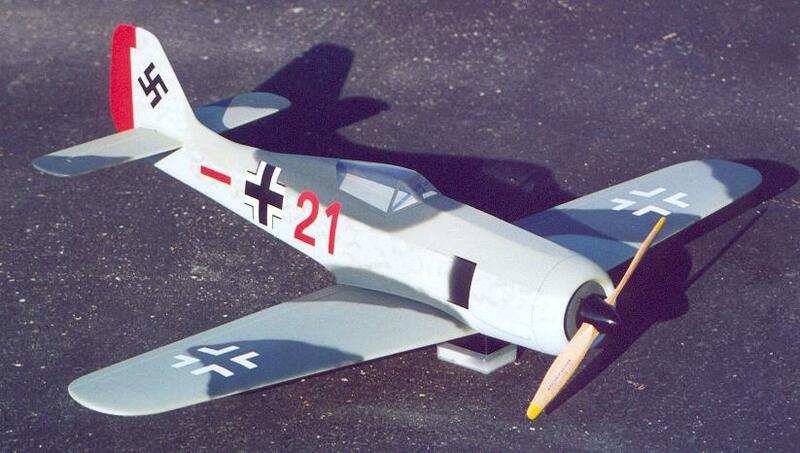 My FW-190 is built from the V�ster Modellbau kit back when it was being imported by Unbeaten Path Imports. The kit includes a gel-coated glass fuselage and Obechi-sheeted foam wings. The wood surfaces were covered with glass cloth and epoxy, and the Jadgeschwader 1 color scheme was re-created with Floquil Military paints. All markings were painted with an airbrush using hand-cut frisket masks. The motor is a geared AstroFlight brushless 05 spinning an 11 X 8 prop, and the battery is 8 X CP-1300 cells. All-up weight as flown is 40 ounces, and the CP-1300 battery pack gives 6 to 8 minutes of spirited performance.